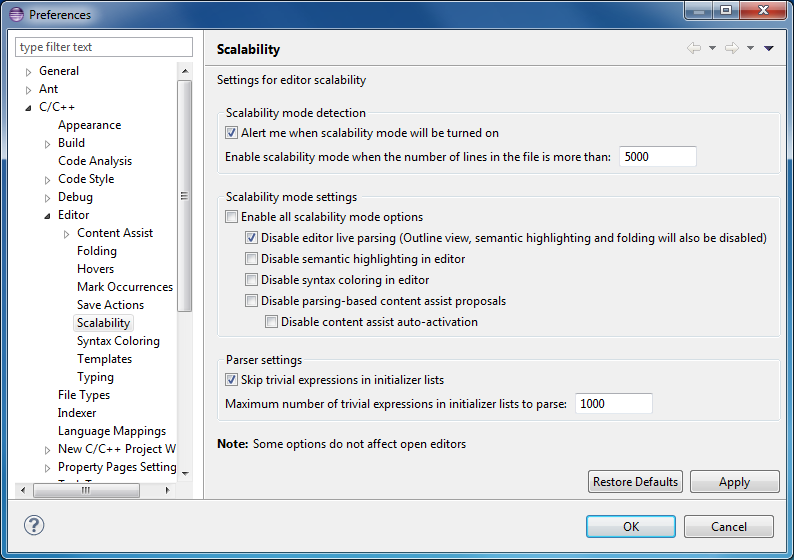 Use the Scalability preference panel to configure options for dealing with large source files. Alert me when scalability mode will be turned on If enabled, an information dialog pops up when a large file is opened with the C/C++ Editor which exceeds the specified line limit. Enable scalability mode options when the number of lines in the file is more than If the number of lines in a file exceeds the specified number the C/C++ Editor will enable scalability mode and all scalability mode options below will take effect. Enable all scalability mode options If enabled, all options below are enabled, too. Disable editor live parsing If enabled, parsing while typing will be disabled. This disables also other features like Outline view, semantic highlighting, folding, etc. Disable semantic highlighting If enabled, C/C++ identifiers will not be colored. Disable syntax coloring If enabled, no coloring of keywords, comments and literals is done. Disable parsing-based content assist proposals If enabled, content assist proposals which require parsing the file will not be available. Disable content assist auto-activation If enabled, content assist will not be activated automatically on trigger sequences, like '. ', '::' or '->'.